Climate change already exists around us, and in various parts of the world. As in France, there has been a drop in snow in several mountains up to 40 cm in the past 30 years. The increase in air temperature reached 1.50C since 1990 on the French mainland, accompanied by an increase in the population of dengue fever mosquitoes in 45 regions in mainland France and a stagnation in the increase in agricultural production. This was expressed by the French Ambassador to Indonesia, Jean-Charles BERTHONNET at the One Hour University event held by the Human Resources Development Agency of the Ministry of Energy and Mineral Resources in Jakarta (29/01). Even according to Berthonnet, climate change in France will get worse if it is not immediately addressed. "In 2050, it is estimated that nearly 50% of forests in France are at risk of burning and a decline of 2 billion cubic meters of water, if we do not make energy transitions," said Berthonnet. Energy transition is a long-term energy management strategy to reduce carbon emissions and increase clean and environmentally friendly energy use. The French government has also implemented an energy transition by establishing a long-term plan, building a conducive relationship by involving stakeholders and being consistent with the policies implemented. It is expected that by 2050, France will achieve Carbon Neutrality. 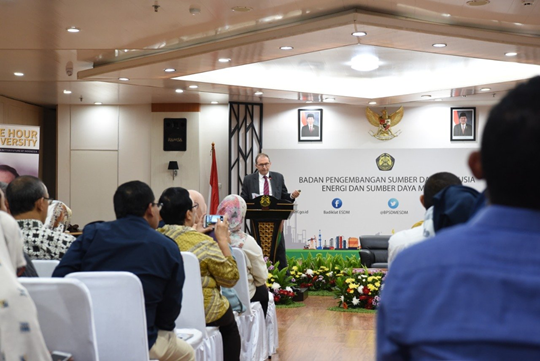 The Indonesian Government c.q The ESDM Ministry has also made efforts to reduce carbon emissions through increasing clean energy use, as a national commitment in reducing emissions in accordance with Law No. 16 of 2016 concerning Ratification of the Paris Agreement to UNFCC and presidential decree (Perpres) No. 61 of 2016 concerning RAN-GRK. In 2018, the reduction in carbon emissions amounted to 43.8 million tons of CO2, this figure exceeded the target set at 36.0 million tons of CO2 and energy savings from 2015 to 2018 reached 31,011 GWH, equivalent to Rp. 31.8 trillion.